Mostly Sample Financial summary represents a formal record of the financial transactions of an establishment or an organization. The reserves, financial backing, projections, performance, the liquidity of that entity should be carefully described so that any one going through it will have a clear cut idea. 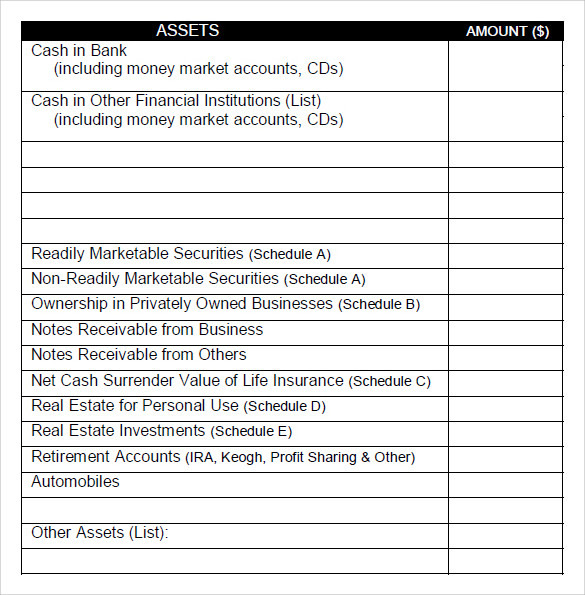 Assets, liabilities, equity, loans, mortgages, dividend, shares, cash, inventory, Bank Statement liabilities, overdraft, etc. 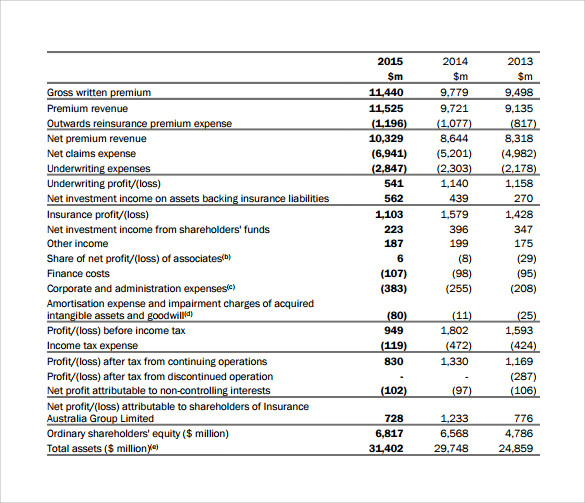 will be given in detail in the financial summary.The profit and loss statement also is an essential ingredient. 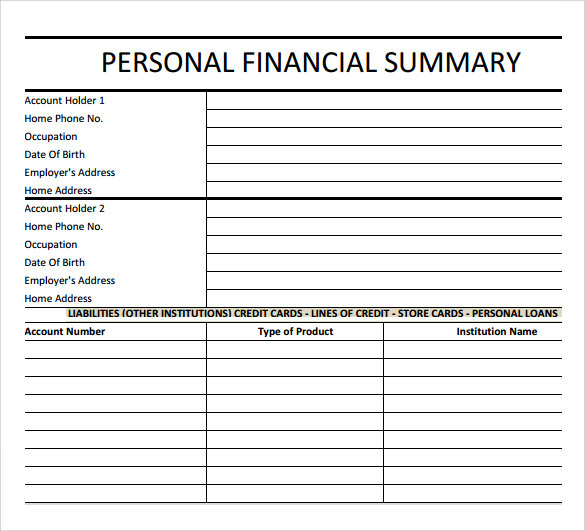 The sample financial summary template can be downloaded from the net either in word or PDF format. 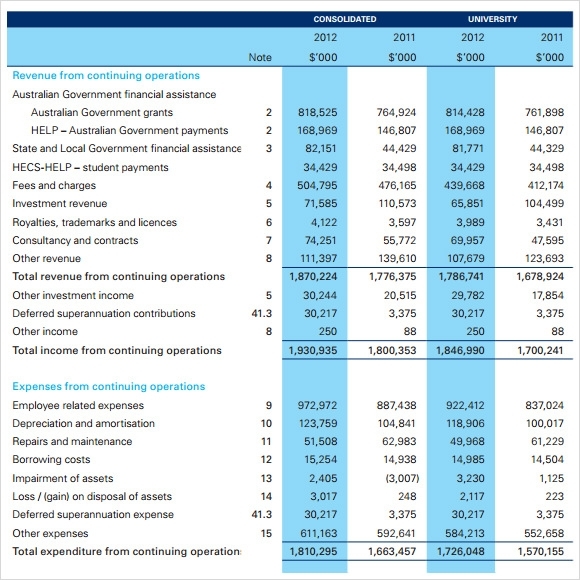 You can also see Budget Summary Templates. 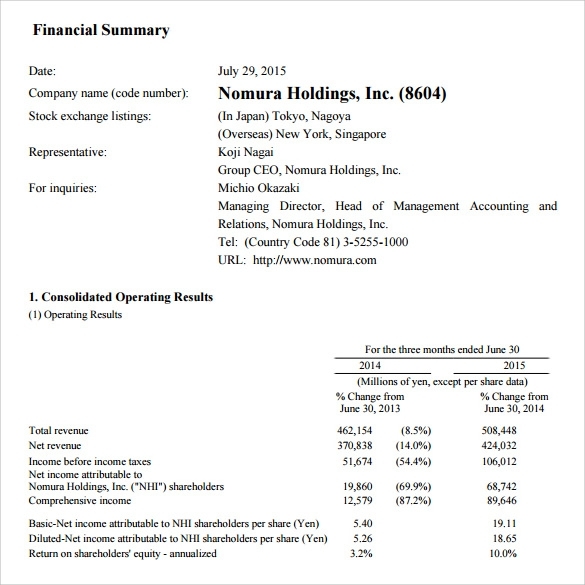 This sample of financial summary template is a summary of the financial status of the company over a period of 5 years. The parameters on which the comparisons are done includes, gross written premium, premium revenue, premium revenue, net premium revenue, underwriting profit and loss, investment income on assets backing insurance liabilities, insurance profit and loss, net investment income from shareholders’ funds and so on. 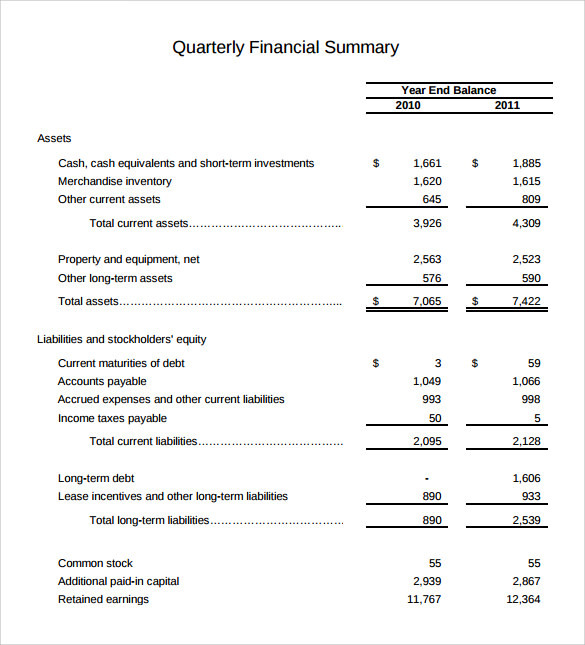 This sample of simple financial summary template is meant for individual usage. The template begins with the name and details of the applicant followed by the details of the account holders. In the third section a report of the liabilities, credit card information, monthly payments and total due amount of each member is taken into consideration. This information is followed by a detailed description of the assets of each account holder. This sample of personal financial summary PDF starts with basic details of the primary account holder, followed by an analysis of both assets and liabilities of all the parties concerned. The template then further proceeds to provide an in-depth analysis of various forms of assets and liabilities which are owned by the primary and secondary applicants. What is the Purpose of a Financial Reporting Framework? The main purpose of a financial framework is to assists the company executives to prepare financial statements and also in applying accounting standards. It also plays an important role in reviewing the current accounting standards so that it can be harmonized in accordance with the regulations and procedures related the preparation and presentation of the financial statements by providing basic alternative accounting treatments. 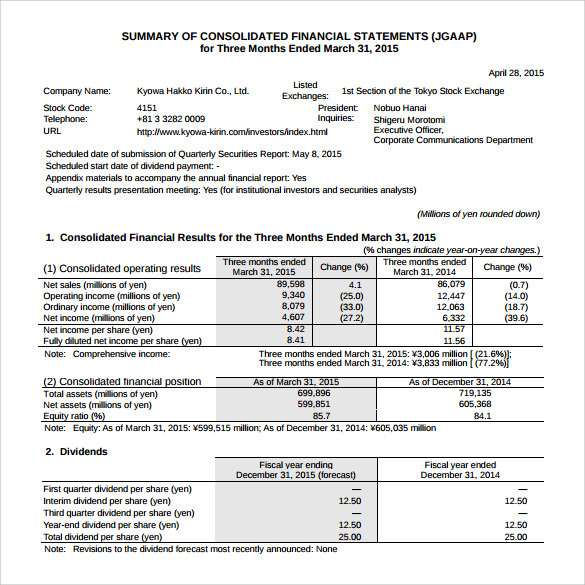 A financial statement framework also aids in interpreting information contained in the financial statement.You can also see Project Summary Templates. What Is The Basic Objective Of Financial Reporting? The basic objective of financial reporting is to provide investors, creditors and lenders with information which would help them to make decisions regarding buying, selling or holding different debt instruments. The primary need of this statement is to have access to the future prospects of the company and also to form an idea about how effectively the management discharged their responsibilities. In short a financial statement contains all information which a user needs to make important financial decisions in respect with the company. What Are The Fundamental Characteristics Of Financial Reporting? Financial survey reports play an important role in helping investors determine how they would use their money in respect to the company. The examples given above would help you to understand the scope of a financial report and prepare one as per the needs.You can also see Business Summary Templates.